Groundhopping is the hobby that allows you the chance to visit some truly dismal places, that you’d never travel to normally, yet find real beauty there. So, why football grounds? Well why not for a start and I’ll be the first to admit the actual game itself is not the be-all and end-all for me, I’m certainly no tactical expert. Often its how you get there, and the people you find that are the really reason I’ve clocked up the miles that I have. Whether its rolling stock at Sobemai, or the North Sea washing over the stand at Arbroath these are the gems I try to seek out. Both of those you can find in this blog. And let’s be honest here, If every single one of these articles were a match report, “Player X passed to Player Y” you wouldn’t be reading this, and I wouldn’t be writing them! After all, a match report is only of interest to those who were there, and the two clubs’ fans. It’s also gratifying to see many of my readers aren’t even football fans, so I’m now adding occasional articles that aren’t about football. It proves, if proof were needed that when it comes to groundhopping, its the additional knowledge of the world and its people that counts. You can’t put a price on that. When I started this blog over 7 years ago, I could never have guessed where it could lead, I was already involved organising groundhops with GroundhopUK, but now we use this blog to help pass on good practice. However the oddest bit, and easily the most gratifying is when I get contacted with the message, “Come and visit us…” and I get to chuck the camera in the back of the car and wonder what on earth I’ll write next. When Robyn and I met during Christmas 2015 everything changed. Apart from the desire to revisit and show her some of the “Greatest Hits” featured in these pages Robyn has turned what felt like a black-and-white existence into a vibrant, full coloured adventure. Other than being a quite wonderful companion during our adventures, she’s become a superb short-lens photographer. Her work has featured in many of these articles, and will be for the time being. In the long term she really ought to have her own vehicle for her talents. Robyn and I’s next big adventure will be our wedding, at some point in 2019. We managed to get engaged on the 28th floor of the Stockholm Radio Tower, and still managed to find a game to photograph in the evening! I promise we won’t do that on our wedding day, in fact I’d rather like to see football banned for the day! Hi Laurence, my name is Mark. You visited our ground Needingworth United in the Cambs County League a few nights ago (vs Hundon). Found your blog to be excellently well written & spoken. I hope you were made to feel welcome & yes your right, we do wish the locals would come down more often although our crowds tend to be a lot better on Saturday’s. We have another home game on the 4th April 7:45pm (a local derby vs Hemingford) if your looking for somewhere to watch a game. Thanks again for your blog & please feel free to come down anytime & watch us again or check out our website http://www.needingworthunitedfc.co.uk for any info for midweek games for next season. Thanks again & keep up the good work. Good work, Laurence. Incidentally, I used to play for Llanfair PG FC amongst other teams in the area many moons ago. Good to see you at STFC on Saturday and trust you had a safe journey back to Oxford. One line you might be interested in the lad Ramone Cuetis was prev with Peterborough and played in the Championship. Have a good season and best of luck for the rest of the season. Great summary of Thornaby v Stokesley game, Matthew is on the mend enjoy your travels. That’s good to hear Paul, it looked a worrying injury. The best advice I can give you is watch a little of everything, if only to find you what you like. For fixture try the Non League Paper, or the local papers, or the FA’s Fulltime service. The organised hops are all posted on Lee West’s forum, http://groundhopping.forumup.co.uk/ and that site is good for postponments and so on. You’ll find there are no lack of hoppers around, who’ll offer you advice, some good some bad, but above all elase have fun. Thanks Colin, Yes no problem at all, but can you provide a website address at the end? Also, I’d love a copy of the programme with the article in it!!!! Only recently discovered your blog and really like it. 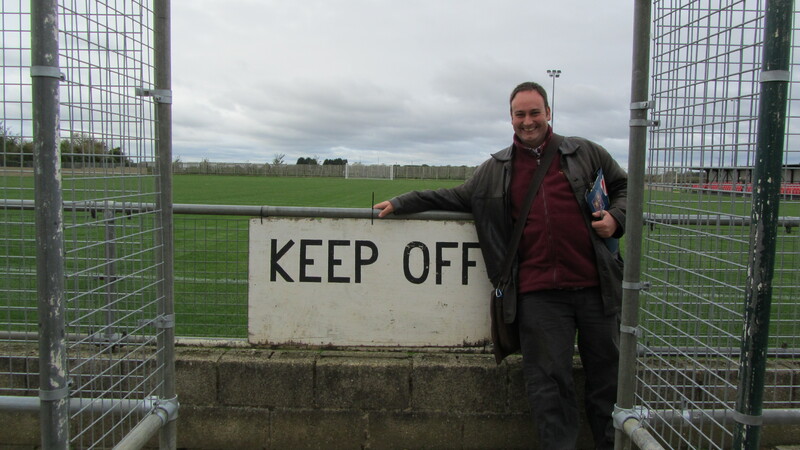 You seem to be attracted to (often novel) football matches in the same way as me – and describe them similarly, in context with their surroundings and the occasion. I’ve just put a link to your blog of at the top of the ‘Further reading’ section of my blog [see below]. If you could provide a reciprocal link I would be very grateful. Hi Laurence. How can I contact you about your blog? Do you have an email address? Lovely article you wrote about our club Portland United, shame the weather wasn’t better for you. On behalf of everyone at PUFC, thank you. I saw your photo of the Arasen stadium in Lillestrom in the German football magazine “11Freude” and I loved it. Do I have the chance to get a signed Fine Art Print of the picture?